Today, I wanted to introduce my friends to one of my favorite things....Matcha! As you know, Matcha is finely ground Green Tea powder that is used in hot drinks, smoothies and baked goods. 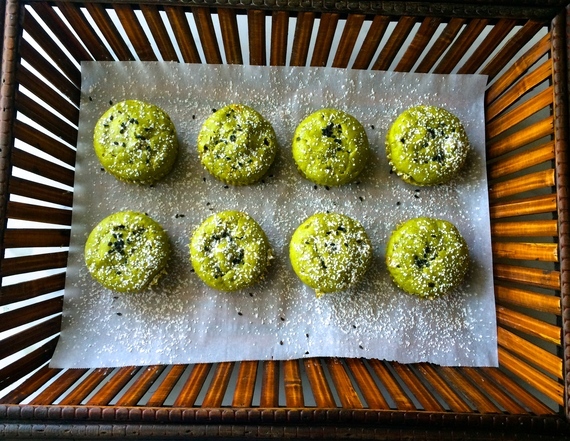 I decided Matcha Muffins would be the perfect breakfast treat for the moms, while the kids played. My kids and I love having friends over. Morning playdates are the best! It's a time for imagination in the sunshine and dress-up clothes for the kids.... coffee and a breakfast treat for the moms. 2. Whisk all the dry ingredients together in a medium bowl. 3. In a large bowl, use an electric mixer to beat the Butter, Brown Sugar and Honey until just combined. 4. Add the Egg and then slowly add the Milk while mixing. Beat until just combined. 5. Add the dry ingredients and (you guessed it) beat until just combined. Ha! 6. Pour batter into a muffin pan that has been lined with baking cups. Fill to about halfway. 7. Bake for about 20 minutes. 8. Once they are done, allow the muffins to cool on a cooling rack for about 10 minutes. 9. Use a flour sifter or small-net strainer to lightly dust the Powdered Sugar over the top. Garnish each muffin with a few Black Sesame Seeds. I served them with a small bowl of melted Kerrygold Irish Butter mixed with Honey. I thought it was the perfect compliment to the fresh tea flavor of the muffins. As is often the case, I started out using a recipe that I found on Pinterest. At some point during the process, I veered off on my own path and changed it up some. I don't know that I can call it entirely original...but of course, there are only so many ways you can make muffins. I mean, how many variations of the Flour/Baking Powder/Salt measurements can there be? Some things have to be exact in baking. But like I've said several times before, I'm no baker...so don't take my word for it. Ha! 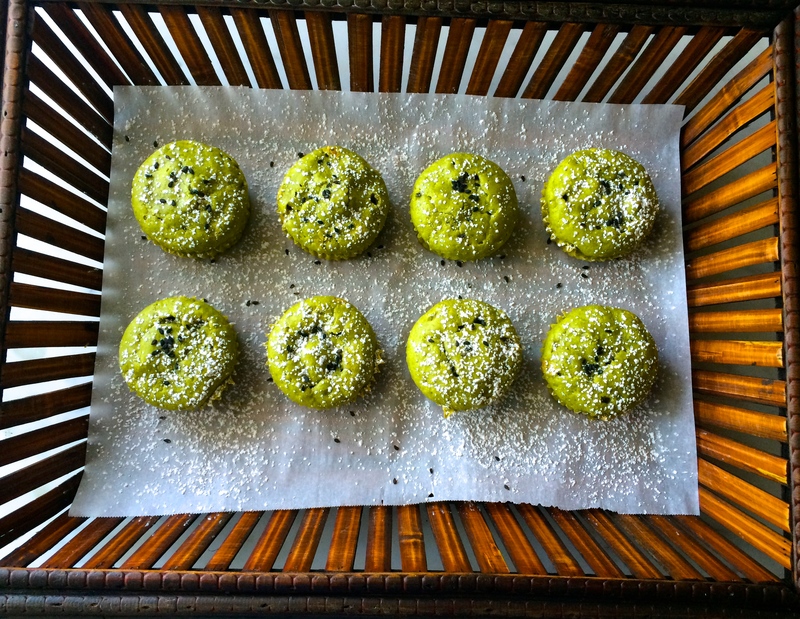 I can say from experience however, that this Matcha Muffin recipe is nonbaker-friendly!